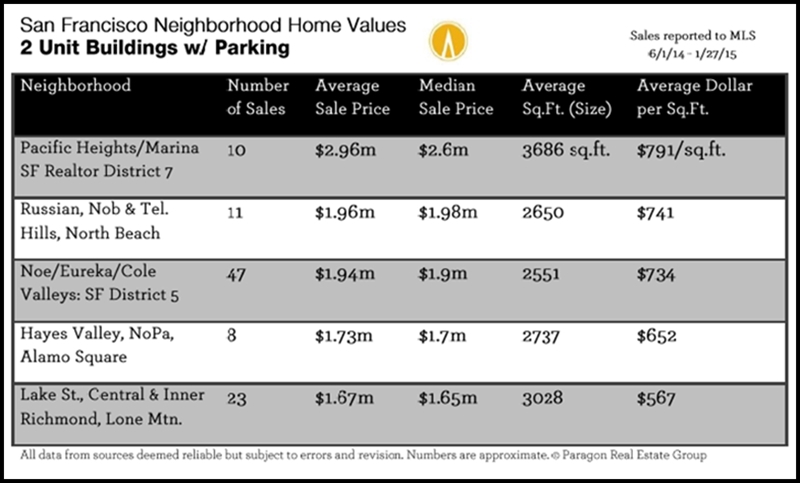 These tables report average and median sales prices and average dollar per square foot values, along with average home size and units sold, by property type and bedroom count for a variety of San Francisco neighborhoods. If you are interested in data for a neighborhood not listed, please contact us. The tables follow the map in the following order: houses by bedroom count, condos by bedroom count, and 2-unit and 3-4 unit building sales. 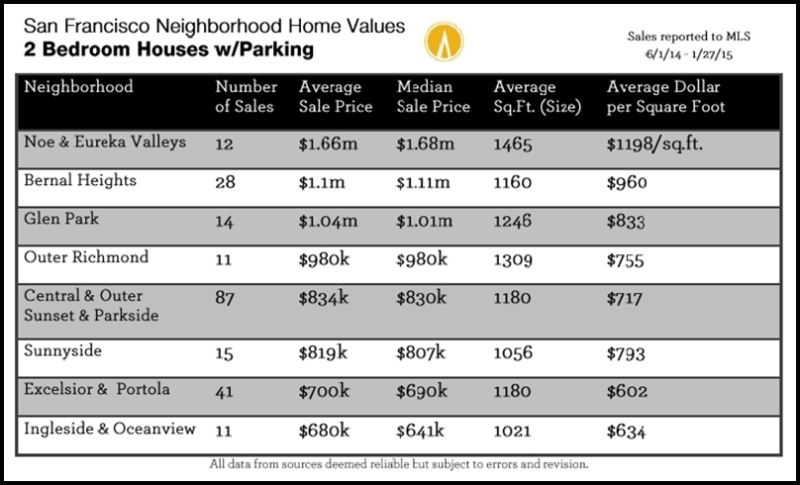 Within each table, the neighborhoods are in order of median sales price. The analysis is based upon sales reported to San Francisco MLS between June 1, 2014 and January 27, 2015. Value statistics are generalities that are affected by a number of market factors – and sometimes fluctuate without great meaningfulness – so all numbers should be considered approximate. Medians and averages often disguise a huge range of values in the underlying individual sales. 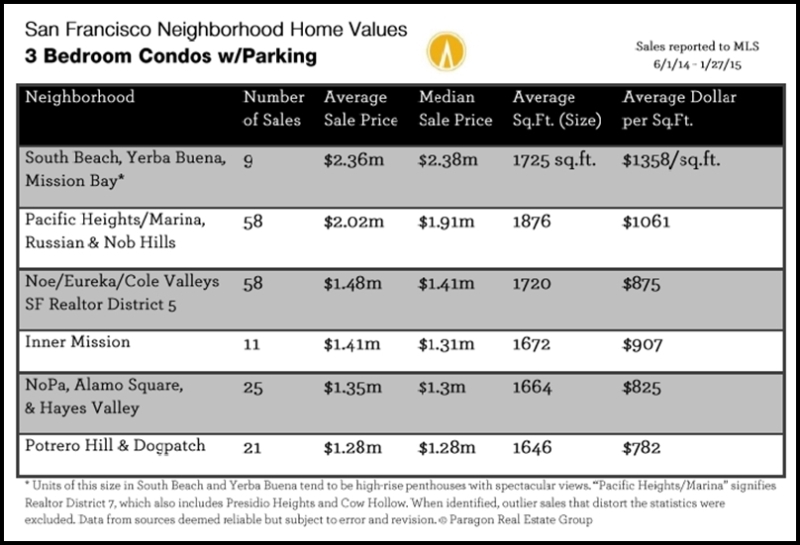 Note: The surge in expensive, new-condo construction sales in various areas, such as Hayes Valley, Potrero Hill, Inner Mission and the Market Street and Van Ness Avenue corridors, is significantly affecting (raising) the average and median values in those neighborhoods. These links below can be used to access other real estate reports and articles. Face it: you’re a geek. Summon your pride and hurry on over to She’s Geeky Bay Area 2015, which takes place this weekend at eBay Town Hall, 2161 North First Street, San Jose. The event runs from 8:15 a.m. to 6 p.m. both days and is billed as the premier networking conference for women in the sciences, technology, engineering and math. Begun in 2007, She’s Geeky was designed as a safe and friendly place for women in these industries to geek out and talk about jobs, passions, lives and hobbies in an encouraging and non-competitive environment. Attendees themselves create conference content, producing what is seen as a unique and free-wheeling place where women can communicate, network, inspire and support one another. Women who attend She’s Geeky enjoy the opportunity to present their work – many times for the first time ever – along with building peer networks and discussing industry-critical issues. The event is billed as attracting women from a broad spectrum of specialties, industries, professions, experience levels and generations. You’re bound to meet people who can help you build and expand your career, knowledge and personal network. The cost for She’s Geeky is $240 for the entire event. Single-day and student and daughter rates are also available. If you’re seeking to expand your knowledge of the tech, math, sciences and engineering fields or you’re just looking to get your geek on, head on down to the eBay Town Hall in San Jose. Remember, you’re in the perfect part of the world to embrace your geekiness! Yesterday we discussed Paragon’s most recent Apartment Building Market report, which was recently released. Today we continue that discussion with a look at new home construction and so much more. So what does this mean? Adding large amounts of new inventory should eventually affect the soaring appreciation for both sale and rental markets. That said, it’s not happening right now since population, employment, wealth and buyer demand are all outpacing supply, especially with large numbers of post-college adults moving back into San Francisco. Full employment is being seen around the Bay Area more and more these days, and employment is also expanding in well-paid industries including high tech. 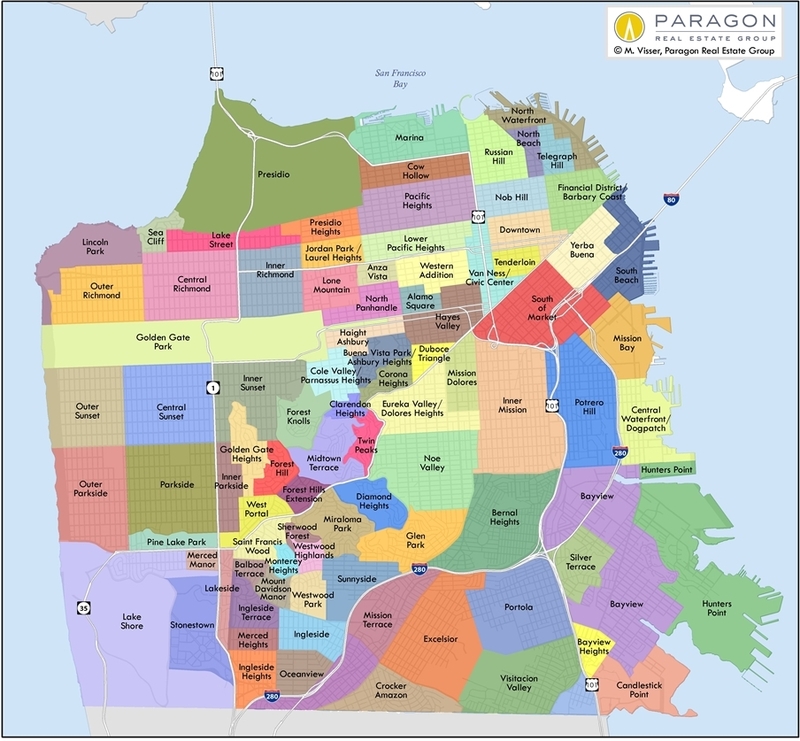 San Francisco is already the second most densely populated in the city and is ballparking to become even more crowded. In terms of property values, apartment buildings saw an increase in the third quarter of last year, with overall appreciation of dollar-per-square-foot values in both San Francisco and Alameda County at more than 60 percent since the market bottomed out from 2009 to 2011. Want to know where you fit in in this picture? Give me a call. How’s the San Francisco apartment market looking? 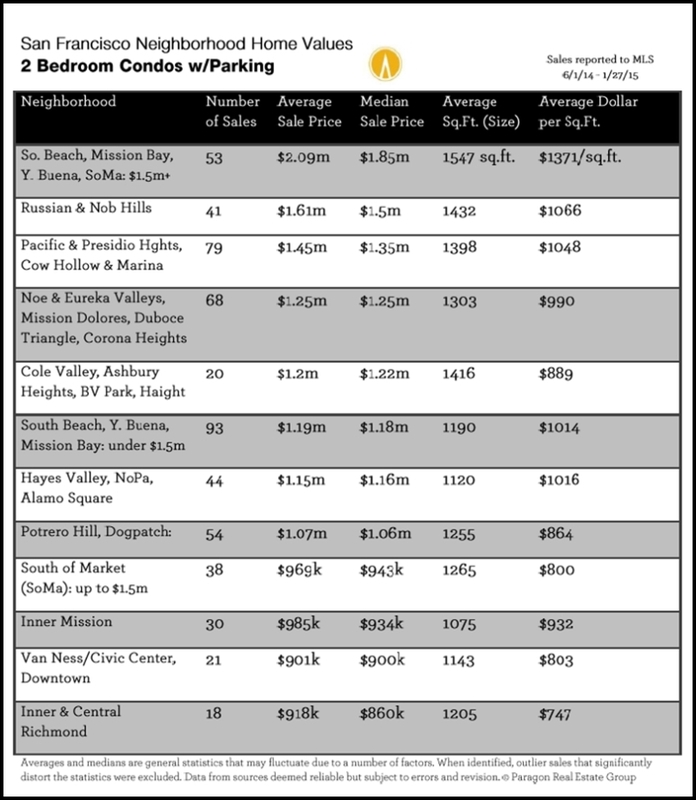 Paragon has released its January 2015 San Francisco Bay Area Apartment-Building Market report, and there’s some good stuff to be had there. Let’s check it out, shall we? First off, dollar-per-square-foot values in San Francisco as well as across the bay in Alameda County are up more than 60 percent since the bottom of the market. Keep in mind, however, that the fact that Bay Area residential investment sales consist of an ever-changing bunch of very unique properties with a huge variety in quality, location, size and era. However, overall appreciation can be considered correct. The appreciation comes on top of the white-hot market seen in the second quarter of 2014 … that is, before fears regarding Proposition G, the transfer-tax-penalty proposal, deeply affected the third quarter. The inventory of listings then jumped and buyer demand went down. Early November saw Prop G fail at the ballot box, causing sales activity to rebound in the fourth quarter. And what about rents? For the last little while we’ve been noticing tentative signs of slowing rent rate appreciation – and in the fourth quarter of last year, San Francisco as well as San Jose and Oakland saw rents flattening, though everywhere in the Bay Area has seen a significant increase on a year-to-year basis. Our neighbor to the east, Oakland, was the star performer for rent appreciation in 2014, with its market given a boost by renters looking for more affordable alternatives to San Francisco. 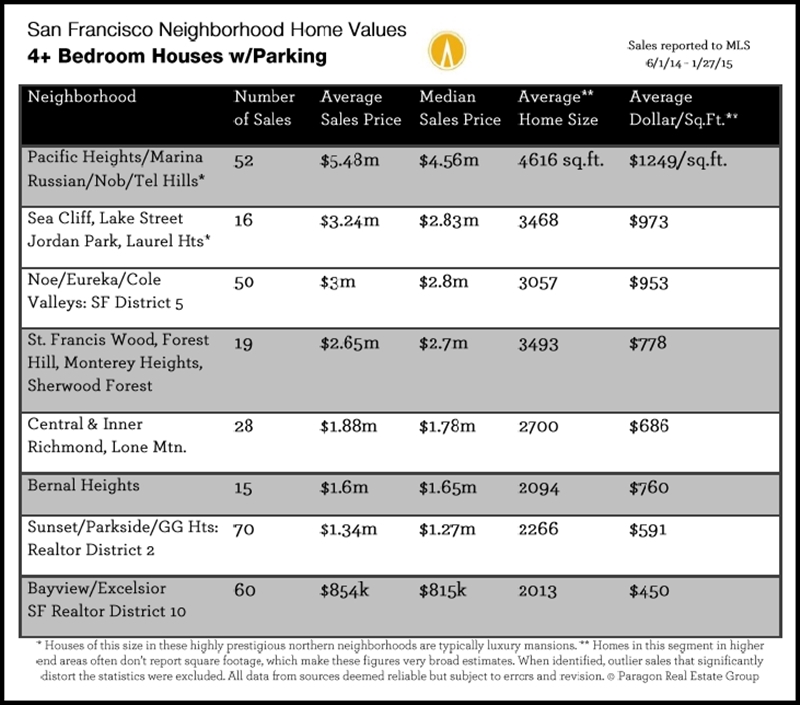 Price premiums are still being seen in the older, northern prestige neighborhoods of San Francisco, though that’s narrowing as other areas of the city such as the greater Noe Valley district are surging in popularity with younger but still affluent renters seeking an easier Silicon Valley commute. Tomorrow we’ll explore this further. Buying a new home is like buying a new car. The sales team will make sure you walk all around it to make sure there are no marks, dings or nicks and demonstrate that everything from the stove to the bathroom sink is in working order. A good buyer’s agent will also be there to go through the home and make sure the sales staff isn’t missing anything or glossing over problems that the developer is required to fix prior to close. New homes offer two warranties. The “fit and finish” warranty is good for one year. This is the warranty that covers cosmetic issues. If paint cracks or fades, grout loosens, or floorboards split during your first year of ownership and the damage is not causesd by the owner, the develop should be on the hook for repairs. The second warranty is set in place by law. This warranty covers building-wide components, like common area electrical, windows and the building’s skin. · Carefully inspecting the walls for uneven pain or spots that may have been missed. · When you hit a countertop, leaning down to check for knicks or scratches. · Cupboards should be opened to make sure the hinges are properly installed and rubber guards are in place. · Making sure appliances are set plumb to the cabinetry and not leaning one way or the other. · Turning on burners, checking the oven and the dishwasher (appliances are under their own warranty, but the developer should make sure they deliver them in working order). · When plumbing fixtures, making sure the hot/cold runs properly and the sink stopper works. · Checking to make sure the closets are properly painted inside and that sliding doors move properly on their tracks. You should be able to fully latch shut every door. Ideally, the sales staff will have a roll of blue construction tape to mark off the items you find. But it can be wise to bring your own roll in case they forget theirs. This kind of attention to detail can drive the sales staff a bit crazy, but remember that you are paying a great deal of money for your investment and deserve a sparkling new home. In my last blog post, I discussed a Bloomberg Businessweek article asserting that the luxury condo market may be taking a hit due to currency challenges for international buyers, particularly in the New York, Miami and Los Angeles markets. While San Francisco is not as heavily populated with foreign buyers as these three cities, we do have our share – and heaven knows we’ve got plenty of high-end condos with more on tap. 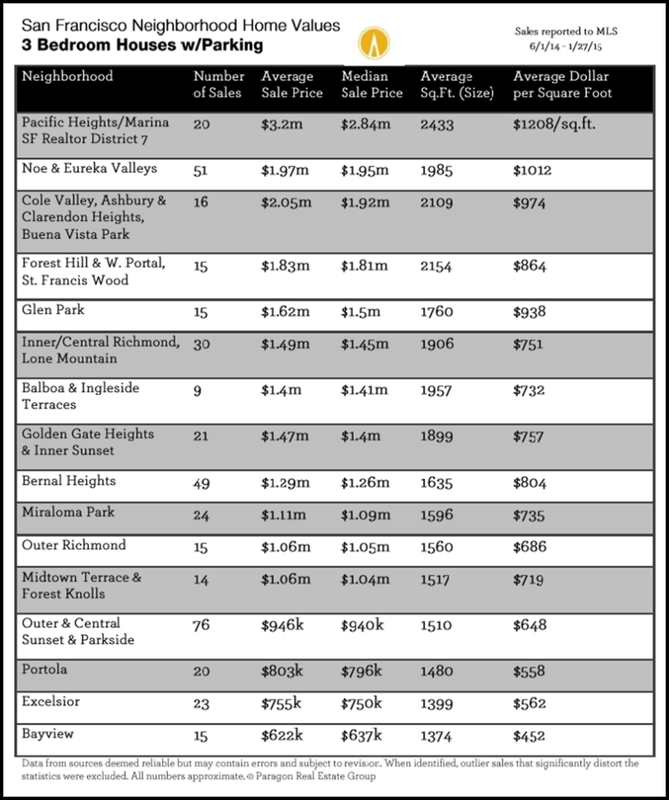 I’d like to share a few statistics with you that serve to compare luxury real estate markets. Keep in mind that numbers are just that – numbers – and if you’re looking to get a better sense of where your personal real estate empire fits in the big picture, it would behoove you to give me a call. According to the Corcoran Group, as reported in Bloomberg Businessweek, Manhattan will see 2,386 new-construction luxury condos listed this year. 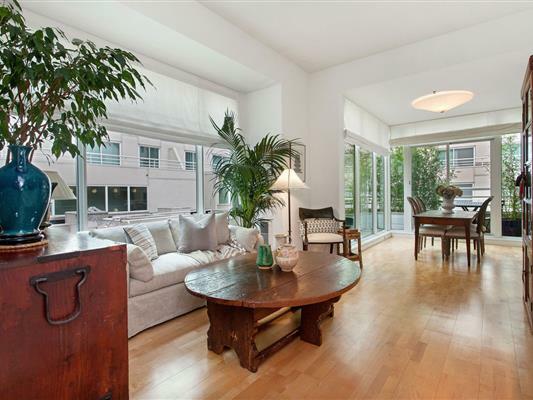 In this case, luxury condos are defined as those priced at more than $2,300 per square foot. In comparison, in San Francisco, a mere six condo sales were reported to the MLS as costing more than $2,000 per square foot (all sold for at least $1.5 million), with the steepest square-foot price tag on a penthouse unit in the Millennium. That one sold for $2,283 per square foot. 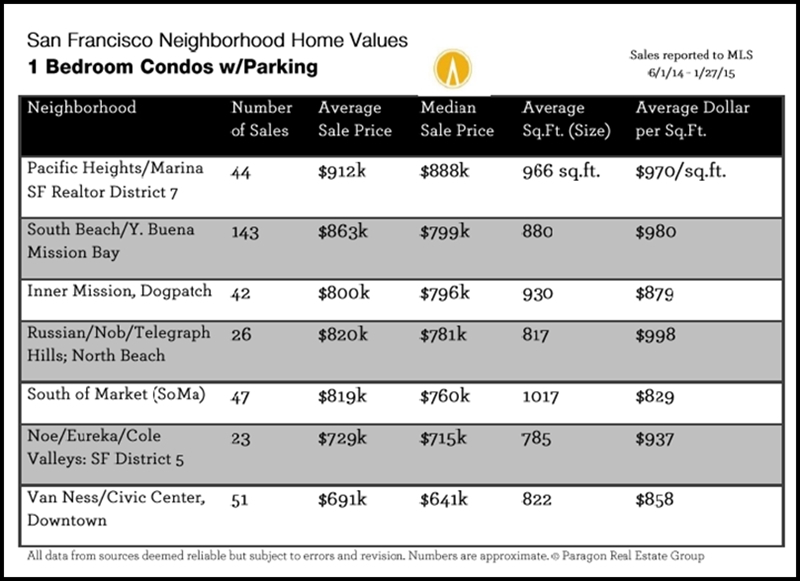 Funny to think that, according to the Corcoran Group definition of luxury condos in Manhattan, we in San Francisco don’t even have a luxury market. Additionally, per the Businessweek article, last year the Los Angeles MLS saw 3,198 homes with asking prices in excess of $2 million and 546 homes with prices exceeding $5 million. 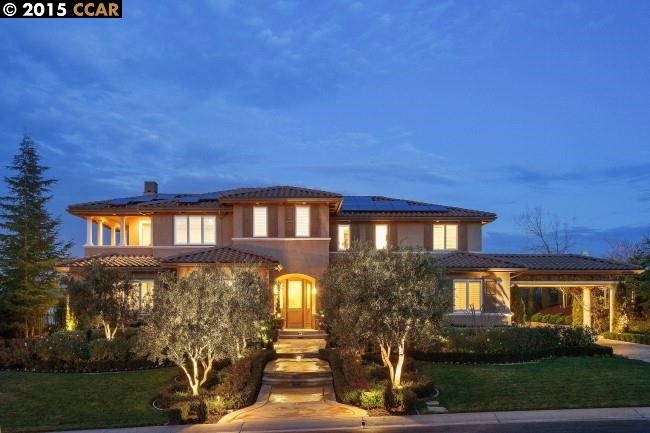 Keep in mind, by the way, that the end of the year is typically the time of the lowest number of high-end listings. Compare that to San Francisco, where as of Jan. 26, there were 60 active home listings for $2 million or above, with only 12 at $5 million or more. At five times bigger than San Francisco, the City of Angels apparently has more than 50 times as many luxury home listings. It’s perspective, people. Recently Bloomberg Businessweek published an article titled “Signs of a Slowdown in the Luxury Condos”. The piece asserts that a strengthening dollar is chipping away at the buying power of international buyers shopping the real estate markets in New York City, Miami and Los Angeles. With currencies including the Euro and ruble plunging against the dollar, this may be a trend to watch. Here in San Francisco, however, we’ve never seen the caliber of foreign buyers seen in the aforementioned three cities. We’re not big in terms of attracting Russian oligarchs and the ultra-wealthy from Latin America. Rather, our affluent buyers are mostly local and most of them are still actively working for a living. But how many luxury condos can any market absorb as increasingly large numbers continue to be planned, built and put up for sale? These days, the opening of an ultra-luxury condo development such as Lumina caused a feeding frenzy of demand for units that probably won’t be delivered until the end of this year. However, as more Lumina-grade developments come onto the market in ensuing years, it will remain to be seen whether we’ll hit a saturation point. Statistics to follow in my next blog post. How’s development going in SF? · Onyx. Potrero Hill one- and two-bedroom residences with elegant, contemporary finishes, according to the project’s website.